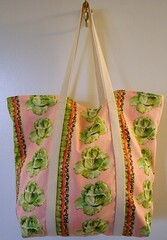 I finished the grocery bags today. Seven ugly-fabulous bags to collect our groceries in for as long as they should last! I actually have an 8th bag cut out and ready to sew, but I don’t have enough cotton webbing left for the straps. Of course, it would be most helpful if we remembered to BRING the new bags when we went on our grocery shopping outing this evening. Tagged canvas webbing, cotton, grocery bag, leopard, lettuce, olive, pink, recycle, reduce, reuse, stash reduction, stripe.